All our crabs are selected and graded by hand for its size and weight. Not all 6-6'/"2 crabs are considered large crabs by our standards some crabs are all point and some crabs are light. We hand grade our crabs to the highest grading scale in the industry. We have three great feast options for you to enjoy. 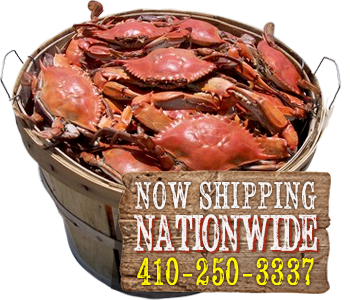 All of our crabs are #1 premium male crabs steamed live to order. Steam Time Is Approx. 20-30 Min. So Relax and Enjoy. All The Feast Are Per Person (No Sharing or Carry-Out). Subject To Availability. No Substitutes or Changes. All our crabs are selected and graded by hand for size and weight. Not all 6" – 6.5" crabs are considered large crabs by our high standards. Some crabs are all point and some crabs are light. We hand-grade our crabs to the highest grading scale in the industry. All of our Crab Cakes are made with pure, fresh jumbo lump crab meat. No fillers are used here! Crab cakes are delicately seasoned in the Eastern Shore style. Come see why so many people think The Crab Bag crab cakes are the best they have ever tasted. We now ship nationwide! Call 410-250-3337 to purchase fresh Crab Cakes.